Roo liked the cheesy flavor, but she is an avid snack cracker fan. I wished they were more pretzelly. Bob couldn't stop eating them. 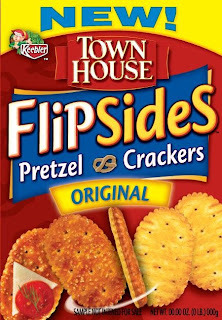 Keebler® Town House® Flipsides™ are definitely delicious but I think I prefer the plain old Town House® crackers with toppings. These newfangled cracker-pretzels are better by themselves. I'm cracking up because that was my tag line too! Haha! Don't you just love Mom Central?